CUVEE ALEXANDRINE is a special wine which is made of 100% "Millerandage" grapes. Generally millerandage is not welcomed, however for limited number of very skilful Burgundy producers, it is very precious and preferable phenomenon. There is a famous story that Henri Jayer loved millerandage so much. There is a hint of exotic fruit to the otherwise fresh and quite pure aromas of various citrus and floral elements. There is good richness and fine detail to the textured and delicious middle weight flavors that culminate in a refreshing finish of acceptable depth and length. This will drink well immediately(BH). Production is only 1,600 bottles CUVEE ALEXANDRINE is a special wine which is made of 100% "Millerandage" grapes. Generally millerandage is not welcomed, however for limited number of very skilful Burgundy producers, it is very precious and preferable phenomenon. There is a famous story that Henri Jayer loved millerandage so much. Domaine Marc Roy is a small familial estate of about 4 ha of vineyards located in Gevrey-Chambertin, (Burgundy). The estate is in the family since four generations, represented now by Alexandrine Roy, Marc's daughter. All the work is made only by the family. They craft distinctive wines in the style of mixture of classicism and modernity. Production is extremely small, but wine is worth to make effort to find. Marc Roy's vineyards are capable to produces “Millerandage”. Millerandage is a kind of mutation in particular year, and berries are small, with thick skin and without seeds. The wine obtains concentration and complexity. 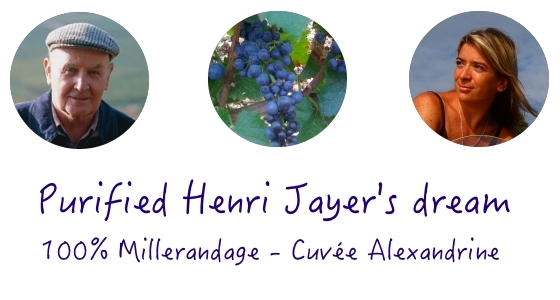 Henri Jayer loved Millerandage so much, and it was one of the secret of his wine. Alexandrine Roy purifies Henri Jayer’s dream, then produces 100% Millerandage wine named "Cuvee Alexandrine" which is the only one in the world. This is a special wine which is made of 100% "Millerandage" grapes. For skilful Burgundy producers, it is very precious and preferable phenomenon. There is a famous story that Henri Jayer loved millerandage so much. Millerandage does not happen every year. So CUVEE ALEXANDRINE is produced in the year which millerandage happened. Marc ROY is the only one producer in in the world. Clos Prieur is located next to 1er cru Clos Prieur and 1er Cru Cerbaudes, and it is also close to Grand cru Chapelle-Chambertin and Mazis-Chambertin. Surface is only 0.27ha. We can find many similarity with Mazis-Chambertin in terms of taste. Made from 70 years old ULTRA Vieilles Vignes from the vineyards of Carougeot, Vignes Belles, La Justice, Es Murots, Les Crais, Les Seuvrees and Jouise. This wine has great aging potential and typical character of Gevrey-Chambertin. Alexandrine and her father Marc obtained small vineyard(1ha) of LA JUSTICE in 2010 and 2011 is the first vintage for them. 70 years old vines, and this vineyard is able to produce Millerandage grapes. Extremely low yield(24-30 hl/ha) produces great concentration and rich taste. Aroma of peach, mango and passion fruits are remarkable. Le guide Fleurus des Vins, La Revue du Vin de France, Le guide Dussert-Gerber des vins... every French wine guide praises ROY. Those guide book put ROY at same or even higher position than top producers like Armand Rousseau, Dugat-Py, Denis Mortet...etc. We have checked all current vintages(2004-2009. directly from domaine). Indeed, Marc ROY is something special. If she could produce a bit more, she might be world-wine famous. Although her wine is "Village" class(no 1er cru, no grand cru), and its style is mixture of classicism and modernity, wine requires 7-10 years cellaring. Marc ROY in the middle of cover page. "Rising stars in Bourgogne 2015"